View the full rage of Chocolate ducks with logo here. Contents: Chocolate ducks - available in different colours and flavours. Colours: Perm sticker attached to side or top of tub up to 4 colour process. Delivery time: 2-3 weeks as standard, please advise if needed sooner and we'll try to accommodate. 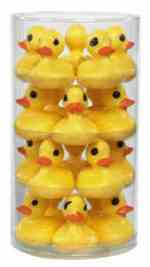 Why not browse through all our other promotional products besides our Chocolate ducks with logo click here. To find out more about our Chocolate ducks with logo click here and fill in the contact form and we'll get straight back to you.